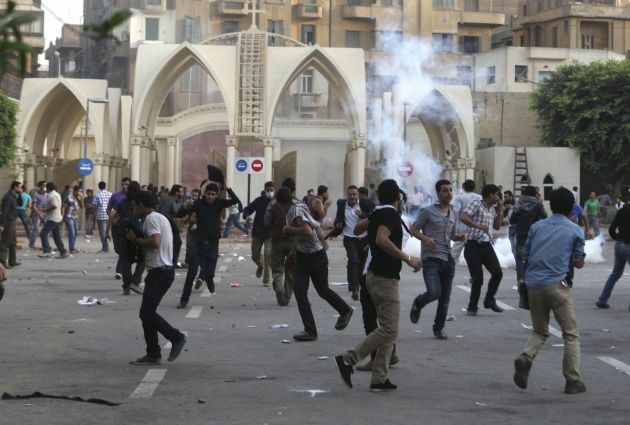 (Photo> REUTERS / Asmaa Waguih)Coptic Christians run from tear gas fired by police inside the main cathedral during clashes with Muslims standing outside the Cathedral in Cairo, April 7, 2013. Clashes broke out between Coptic Christians and Muslims in central Cairo on Sunday after the funeral of four Copts killed in sectarian violence outside the Egyptian capital on Friday night, witnesses said. Pope Francis and the head of the World Council of Churches, Rev. Olav Fykse Tveit, have joined the United Nations and international leaders in issuing pleas for peace and dialogue in strife-torn Egypt where at least 638 people have been killed since Wednesday. "Let us pray together for peace, dialogue and reconciliation in that dear nation and throughout the world," said the Pope Francis after a service at the papal summer residence of Castel Gandolfo southeast of Rome on Thursday. Francis lamented the "painful news" coming from Egypt following the bloody crackdown there by security forces on protesters and appealed for "peace, dialogue and reconciliation." U.S. President Barack Obama called on the Egyptian authorities to respect the universal rights of the people. "We call on those who are protesting to do so peacefully and condemn the attacks that we've seen by protesters, including on churches. "We believe that the state of emergency should be lifted, that a process of national reconciliation should begin, that all parties need to have a voice in Egypt's future, that the rights of women and religious minorities should be respected, and that commitments must be kept to pursue transparent reforms of the constitution and democratic elections." Later Thursday, the U.N. Security Council urged all parties in Egypt to exercise maximum restraint. The World Council of Churches general secretary Tveit, said, "The only way forward is for mutual recognition as equal citizens within Egypt, sharing responsibilities and authority, accepting the diversity of political opinions and religious beliefs." The bloodbath was triggered after Egypt's military regime began a forceful clearance of two Cairo sit-ins where protesters were demanding the reinstatement of deposed Islamist president Mohamed Morsi who is backed by the Muslim Brotherhood, but was ousted by the military on July 3. The Egyptian newspaper Ahram Online reported churches across Egypt came under frenzied attack Thursday as the country became convulsed in the violent turmoil. This came after security forces forcibly broke up two major Cairo protest camps held by supporters of Morsi who was ousted by the military on July 3. Ahram reported that Morsi loyalists launched nationwide assaults on Christian targets, wreaking havoc on churches, homes, and Christian-owned businesses throughout the country. It quoted Coptic rights group the Maspero Youth Union (MYU) saying that as many as 36 churches were "completely" devastated by fire across nine Egyptian governorates. The Christian Post quoted Bishop Angaelos, the Cairo-born head of the Coptic Orthodox Church in the United Kingdom, saying he had heard that 52 churches had been attacked. The largest Christian community in the Middle East, Copts, account for about 10 percent of Egypt's 84 million people. Their leader Pope Tawadros II initially spoke in support of the coup that ousted Morsi. This followed the marginalization and increased attacks on Christians, but his support seemed to have exacerbated the situation for Egypt's Christians. In a letter to the WCC member churches in Egypt the WCC's Tveit said, "Since 25 January 2011 Egypt has been experiencing a critical moment in its history. Tveit noted, "The Egyptian people showed on different occasions their belief in a multi-religious and multi-cultural society where all parties join hands in facing the current challenges and building a better future based on social justice and human dignity. "The World Council of Churches and its member churches are greatly concerned by the violent turn of events in Egypt and call for an immediate end of violence from all sides." The WCC is a grouping of mainly Anglican, Orthodox and Protestant churches representing more than 500 million Christians. While the Roman Catholic Church is not a member, it serves of WCC bodies and works closely with it. United Nations High Commissioner for Human Rights Navi Pillay noted comments of UN Secretary-General Ban Ki-moon that violence and incitement from any side will not solve anything in Egypt. "What is needed is genuinely inclusive reconciliation. I therefore appeal again to all sides to engage in urgent dialogue to avoid further violence and hate speech, with the aim of restoring constitutional order through free and democratic elections," she said from Geneva on Thursday.